François Payard on chocolate. Mort Rosenblum on chocolate. A practical book packed with versatile and adaptable recipes: a delight. Melt finely chopped dark (56% preferred) chocolate; heat (stirring) till about half-melted; then remove from heat. Stir (off heat) till all melted and smooth. Return to heat; raise up to to 115°; take care not to exceed 120°. Remove from heat; stir in the reserve (about 20% by weight) chocolate, also finely chopped. Stir (off heat) till all melted and smooth. Continue stirring till the chocolate cools to 82°-84°. THIS CAN TAKE 15-30 MINUTES. Gently warm over barely simmering water for about 10 seconds, to warm gently to 88°; it is crucial not to exceed 90°. 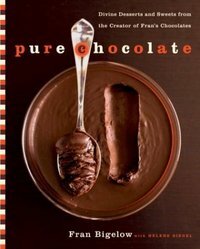 See her book for more on testing for temper and working with tempered chocolate. "Everything you need to know about chocolate." "Amazing cookies and brownies." WOW: p. 44 for her White-Chocolate Coconut Cream Bars. "Tortes, with and without flour." "Celebration cakes and holiday specialties." "Sumptuous cheesecakes, puddings, and custards." "Five beverages and a snack." "Truffles and other fine chocolates."